A few days ago, I met my sister and her colleague for dinner. Her colleague said, hey you should take a photo of this. This is the only reminder that her school, Raffles Girl School ever existed in the city centre at Queens Street. The school gate. The site now houses the 3rd university in Singapore, the Singapore Management University. Is the school that you went to when you were a little kid still around? It looks very odd just sitting there like that. Good of them to keep something as a memorial though! Wow, that's not much - just that little gate? I believe the 2 schools I went to are still very well around. 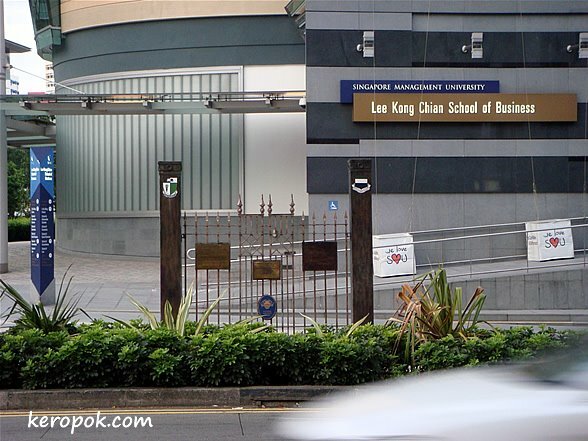 My school Chung Cheng High Schhol (Main) was set up in 1939, before World War II and the Japanese occupation.